A man from Caribou is suing for the right to continue taking his addiction treatment medication when he serves an upcoming sentence, in a case that could change the way Maine jails and prisons handle inmates with substance use disorders. Zachary Smith, 30, filed a civil rights lawsuit in federal court Thursday against the Aroostook County Sheriff’s Office and Maine Department of Corrections, challenging their policy of not allowing inmates to continue their prescribed medications, such as buprenorphine or methadone, while incarcerated. Smith became addicted to opioid painkillers as a teenager. He sought a doctor five years ago who prescribed buprenorphine and ushered him into recovery, Smith said. In 2016 his sister, Karli Adams, died of a heroin overdose, devastating his family. “I’m scared to die. I don’t want that to happen to me,” Smith said. 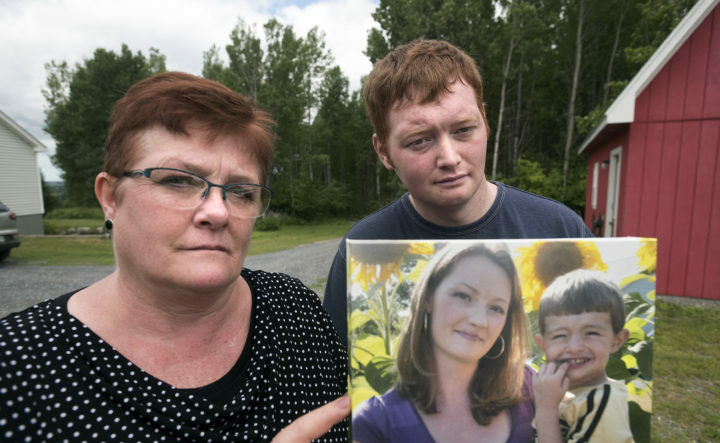 Cindy Levasseur with her son Zachary Smith, 30, of Caribou pose with a picture of her daughter Karli Adams, who died of a drug overdose in 2016. Levasseur is now raising her grandson Karson Reidy, and she is afraid Zachary might relapse into drug use. Zachary Smith filed a civil rights lawsuit in federal court Thursday against the Aroostook County Sheriff's Office and Maine Department of Corrections for not allowing him to continue his prescribed addiction treatment medication when he starts serving a nine-month sentence starting in September. Most jails and prisons do not allow inmates to continue taking their addiction treatment medications. Inmates are, therefore, forced into withdrawal, which can involve vomiting, severe anxiety, sweats, depression and seizures. They are at heightened risk for overdose upon their release, according to studies. Methadone and buprenorphine are standard treatments outside of jails and prisons, and have been shown to reduce drug use and reoffense rates. The American Civil Liberties Union of Maine is bringing Smith’s case. Similar lawsuits are underway in other states, including Washington. The case rests on two legal arguments: that the long-term consequences of forced withdrawal violate Smith’s right to be free from cruel and unusual punishment under the Eighth Amendment of the U.S. Constitution, and that denying him medical care violates the Americans with Disabilities Act, since people in recovery are protected from discrimination in medical care under that federal law. The ACLU also filed a motion for a preliminary injunction, which could speed up the court process to have Smith’s case heard before he begins serving his sentence. Smith said he expects to report to the Aroostook County Jail in Houlton Sept. 6 but could then be transferred to a state prison facility. He pleaded guilty to assaulting his biological father, from whom he is estranged, and will serve nine months. “He’s willing to do his time, but he wants to make sure he doesn’t put himself in serious harm’s way,” said Emma Bond, staff attorney for the ACLU of Maine. Smith started using painkillers around the age of 14 or 15 after experimenting with a family member’s medication, he said. He began taking OxyContin regularly around the age of 16. Then, at age 18, he was prescribed Vicodin for chronic pain, due to scoliosis and two herniated discs in his back, he said. But when he told his nurse practitioner he had a problem, he said the provider cut him off quickly and didn’t offer treatment. Starting in 2007 he spent five months in jail for stealing drugs. He experienced withdrawal and described it as “hell.” After his release he moved to Lewiston for residential treatment, but relapsed afterward. It wasn’t until 2012, when his grandfather died, that he returned to Caribou and sought help from a doctor licensed to prescribe his medication. Zachary Smith, 30, of Caribou with his mother Cindy Levasseur. Smith filed a civil rights lawsuit in federal court Thursday against the Aroostook County Sheriff's Office and Maine Department of Corrections for not allowing him to continue his prescribed addiction treatment medication when he starts serving a nine-month sentence starting in September. “If I did not get on buprenorphine I’d probably be dead,” he said. His family pays for the medication out of pocket. It costs $144 per month. Shawn Gillen, chief deputy and acting Aroostook County sheriff, said he couldn’t comment on the lawsuit before reviewing the complaint. Joseph Fitzpatrick, commissioner of the Maine Department of Corrections, didn’t respond to a request for comment. A phone call to Katahdin Valley Health Center, the jail’s medical provider, was not returned. In the past, sheriffs have expressed opposition to providing medication-assisted treatment to inmates because of the cost and fear of diversion. Buprenorphine and methadone are narcotics in their own right, but don’t produce a high when taken as prescribed. Just one jail in Maine, Knox County Jail, allows certain inmates to take buprenorphine, commonly known by the brand Suboxone, while another jail, Penobscot County Jail, started offering the injectable naltrexone, known as Vivitrol, on a limited basis last year, according to a BDN review of all jail facilities in July 2017. Jails allow pregnant women to take methadone since withdrawal can endanger the pregnancy. An estimated 70 percent of all inmates in local jails nationwide have committed a drug offense or used drugs regularly, and an estimated 35 percent were under the influence at the time of their offense, according to the Bureau of Justice Statistics. Cindy Levasseur, Smith’s mother and a fifth-grade teacher, said she already lost one child and is now afraid of losing another. She and her husband, J.P. Levasseur, are guardians of their deceased daughter’s son, who is 11. In addition to her sorrow and the pressure of raising her grandson, she has felt the stigma associated with addiction. “I feel like I have a big scarlet letter on my chest,” she said. Then she read an April story in the Bangor Daily News about how a U.S. Department of Justice investigation into whether Massachusetts prison officials are violating the law by denying prisoners’ medication could have consequences for Maine prisons and jails. She and her son decided to contact the ACLU to see if they had legal recourse, and the ACLU took their case. It mailed letters to the Aroostook sheriff and department of corrections, asking that they allow Smith to take his medication, but Heiden said they didn’t respond. Levasseur said she decided to talk publicly about her son’s situation because she’s not only concerned about his health but also the wellbeing of her grandson’s generation. “I don’t want that cycle to keep going,” she said.